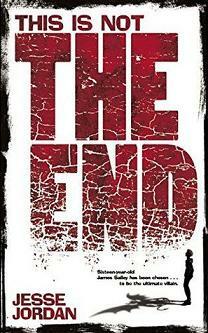 This is not the End, by Jesse Jordan, is a new and interesting young-adult take on the whole Anti-Christ end-of-the-world war between Heaven and Hell mythology. Fifteen year old James Salley seems to be your typical downtrodden teen. Picked on at school, disliked by almost everyone (even his parents), he's been struggling with depression and figuring out where he fits in--or if he fits in at all. If not for his obsession with drawing comics and the most Beautiful Girl In The World Dorian (who actually does like him) he might as well as toss in the towel. And now, on top of that, he finds out he's the Antichrist and will be responsible for ushering in the final war that will end two worlds. But being the Antichrist isn't all it's cut out to be. A secret society is hot on his trail, sworn to kill him before he can bring about the apocalypse. He can't tell anyone, and the new "powers" he supposedly has don't really seem to be good for too much. And then, just when things are start to turn the corner and heat up with Dorian, he's forced into action by Ezra, the mysterious new school librarian/Antichrist mentor who's obviously much more than he seems. Add in weird dreams, bullies, and more than your fair share of teenage angst, and you end up with a book that's sure to please any young adult, and even some older ones as well. My only quibble is with the pacing as the book nears the climax. After an almost languorous journey of discovery alongside James, he (and us along with him) are suddenly thrust into the thick of things, and thick it is. So thick it left me bumbling about for the solid and enjoyable plot I'd been following up to that point. Truth be told, I sort of lost track of what was going on in what turned out to be the final showdown -- and honestly why it mattered. As a result, the end left me unfulfilled. Jordan had done such a good job with the story and the characters that the last few chapters felt thin and incomplete in comparison to the rich and detailed happenings of all that had come before. It's as though it went from reality to fever dream as quick as the flip of a switch. Maybe that was Jordan's goal to begin with, but as a reader, it felt too jarring and disconcerting. Also... Taloon. That's the name of the city on the "other side" where James Salley has to journey in order to bring about the war to end all wars. It's been a long time since my Elric days, but Taloon reminded me in no small way of Michael Moorcock's Tanelorn. I don't know if that was intentional, or if my aged recollections are drawing a comparison where none exists, but the whole incoherent ending had a very Moorcockian feel too it, much out of sync with the rest of the book. Nevertheless, I think most readers of fantastic fantasy, especially those who enjoy a unique twist on Biblical prophecy, will have some fun here. The footnotes Jordan adds to further explain people and events throughout the book are an original and enjoyable device.